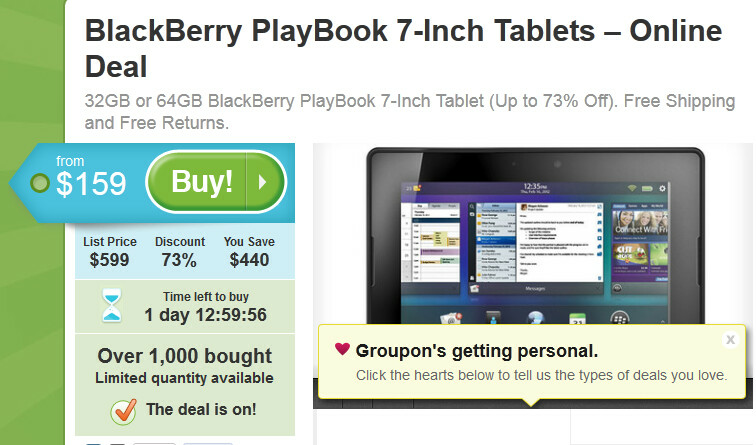 If you're looking for a great price on the BlackBerry PlayBook, you will be hard pressed to find a better deal than the one offered by Groupon that is good through midnight Eastern time Saturday. The 32GB variant of the tablet is priced at $159 while the 64GB model will cost you $199. Groupon is adding free shipping and free returns. According to Groupon, they have sold over a thousand PlayBooks and a limited quantity remain. Additionally, it should be noted that Groupon is limiting the purchase of the tablet to one per person. And you can expect delivery of your BlackBerry PlayBook sometime in the first 2 1/2 weeks after your order. Thanks to Groupon, the BlackBerry PlayBook can now compete price-wise with the Amazon Kindle Fire , the Amazon Kindle Fire HD and the Google Nexus 7. Once midnight strikes and Saturday turns into Sunday, this is no longer true. 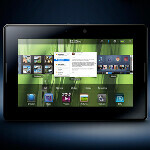 If obtaining the BlackBerry PlayBook has been on your wish list, here is your opportunity to cross it off. To take advantage of the deal from Groupon, click on the sourcelink. If this was getting Blackberry OS 10 for tablet that would be amazing. They said it would back in Q1 so I'm hoping they keep their word. yup... its getting BB10 but on q2 or early q3...according to the roadmap! bring the 32gb to $ 49 and i will buy. actually it is still a good deal... why? coz it will be getting BB10 and the Playbook is one of the best 7" non-android out there!!! and i mean, for only $149 for 16GB?! and with unique OS and elegant UI out there... it is a killer for a deal! I ordered a 32 gig for 139. I have 2 android tabs but I thought it would be fun to have something else. It should be here by thursday. I have to say I am pretty exited! aawww...this deal is pretty damn good!! !